Customer experience agency MercerBell Australia, part of the Publicis Groupe, continues to revamp its senior leadership structure across Sydney and Melbourne with three internal promotions, following the recent announcement of key leadership hire, executive strategy director Brad Bennett. Matt Olanda is promoted to client services director, Paul Henderson becomes general manager of operations, and Jessica Farrell is promoted to the leadership team as people and culture director. Top (L-R): General manager of operations Paul Henderson & Toyota lead Ellie Ward. In addition, Toyota lead Ellie Ward is added to the MercerBell leadership team as the Melbourne office’s representative. The changes follow the promotion of Julie Dormand to CEO at the start of 2019, taking over the leadership baton from founding partner Nick Mercer, who was appointed chairman of MercerBell Australia and country lead for Publicis Data Spine. Fellow founding partner David Bell remains on the leadership team as executive creative director. All leadership team roles will report into Dormand. Commenting on the appointments, Dormand said,“Following three successful years of growth within the Publicis Groupe, we have evolved the leadership structure so that we will continue to see MercerBell thrive as a sought-after CX agency. Matt Olanda is promoted following five years at MercerBell, after starting as an account director and working his way up to run accounts including Caltex, AMEX, Carnival and Pernod Ricard. Paul Henderson will extend his role to take on more commercial responsibility alongside CEO Julie Dormand, as well as continuing to head up the production and technology teams. Henderson has been with MercerBell for 17 years and has overseen the growth and adaptation of the agency’s operational delivery. People and culture director Jessica Farrell joined MercerBell a year ago, following HR roles at Virgin and Nike in the UK. Her promotion is a reflection of her work to date in developing an employee-first approach, championing culture and diversity throughout the agency. In addition, group account Director Ellie Ward joins the leadership team as the senior advocate for the Melbourne office. Ward is an experienced CX marketer with experience at Target, Lavender and M&C Saatchi prior to joining MercerBell. 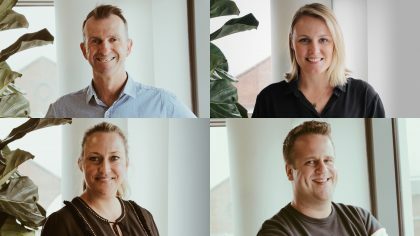 The revised leadership team is the next step for MercerBell that has seen the agency post year-on-year growth since being acquired by Publicis Communications in 2016, winning key accounts such as NRMA Motoring & Services, and continuing to work with long-standing clients such as Toyota, Nestle Purina and Qantas. Image Caption: Top (L-R): General Manager of Operations Paul Henderson & Toyota lead Ellie Ward. Bottom (L-R): People and Culture Director Jessica Farrell & Client Services Director Matt Olanda.